Domodedovo-based S7 Engineering (part of Russia’s independent MRO provider Engineering Holding) has been authorized to provide maintenance and repair services on evacuation and oxygen equipment produced by the international group Zodiac Aerospace. Engineering’s subsidiary thus expands its partnership with Zodiac Aerospace Services, which is responsible for aftersales support of Zodiac products. In the future, more items could be added to the list of equipment serviced within this partnership. S7 Engineering is currently the only MRO provider in the CIS enjoying the full range of technical support from Zodiac Aerospace Services. Zodiac Aerospace and Engineering struke a general partnership agreement in the summer of 2015. In December same year, the partners signed a contract to set up and operate an joint aircraft lavatory maintenance facility at S7 Engineering’s Moscow base. The JV was officially launched in late 2016. The contract was extended in August 2017 to cover airstairs and oxygen equipment. 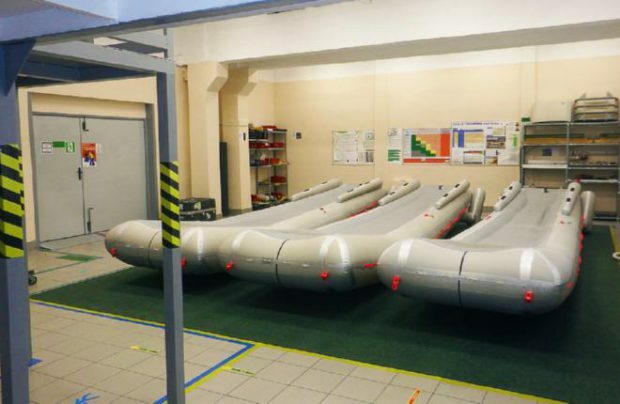 S7 Engineering already had extensive experience with such systems: the original airstair and oxygen equipment shop had been opened back in 2008. According to Filippov, the expansion of the agreement with Zodiac Aerospace Services significantly expanded the list of items serviced by S7 Engineering. Thanks to its partnership with Zodiac Aerospace Services, S7 Engineering is now capable of servicing airstairs, oxygen bottles, and life rafts/escape slides on virtually any aircraft type. S7 Engineering’s toilet maintenance facility offers services on Antonov 148/158, Boeing 737CL/NG, 747-400/767/777, Airbus A320 family, and A380 airliners. The airstairs and oxygen equipment shop serves Beriev Be-200s, SSJ100s, Tupolev Tu-204s, Comac ARJ21s, the Airbus A320 family, Airbus A350s, Boeing 737CL/NGs, and Boeing 747/757/767/777/787s. There are several other companies in the region offering evacuation and oxygen equipment maintenance services. Ural Airlines, for one, opened an emergency slide maintenance unit in November 2017. However, Filipov notes, S7 Engineering is the only MRO specialist providing its customers with advanced support by proxy of Zodiac Aerospace Services. The Domodedovo water and waste treatment facility, and also its evacuation and oxygen equipment shop, unergo regular audits by the international company. They both have access to Zodiac Aerospace’s latest technical documentation updates and round-the-clock support. It is highly possible that cooperation between Engineering and Zodiac Aerospace will not be restricted to lavatories, airstairs, and oxygen equipment. So far, however, the Russian company prefers not to provide any further detail. “There are certainly prospects, and we are in discussions,” Filippov comments. “Most importantly though, further sustainable and gradual expansion of our agreement with Zodiac Aerospace depends on mutual trust, which is dependent on the reliable operation of the two companies’ corporate systems engaged in servicing the equipment currently covered by the contract. Filippov did not rule out that Engineering’s other bases, at Novosibirsk’s Tolmachevo airport and in Mineralnye Vody, would also be covered by the project. Cooperation between Engineering and Zodiac Aerospace definitely has more to it than just authorized maintenance of equipment, although that aspect is also very important to the region. Zodiac Aerospace is viewed as a supplier for Russia’s Irkut MC-21 narrowbody airliner program, and Engineering is known to have been interested in provining maintenance on the type in the future. When interviewed in the summer of 2017 by Russian Aviation Insider, Filippov said: “We are of course eager to enter the aftersales market for the [MC-21] program. In the recent years we have had some successful experience cooperating with a number of manufacturers that will supply equipment for the MC-21. I am convinced that we would be able to implement this experience in the best way. It is a great platform for developing future competencies as applied to the next generation of components and systems for the MC-21.